Barely related to the long-running all-round Honda CBR600F – the Honda CBR600RR is a track biased missile – and an excellent one. On the road, the ‘F’ version is a better bet for most with a more roomy riding position, stable handling and a less revvy engine but get the Honda CBR600RR on the track and it’s in its element. 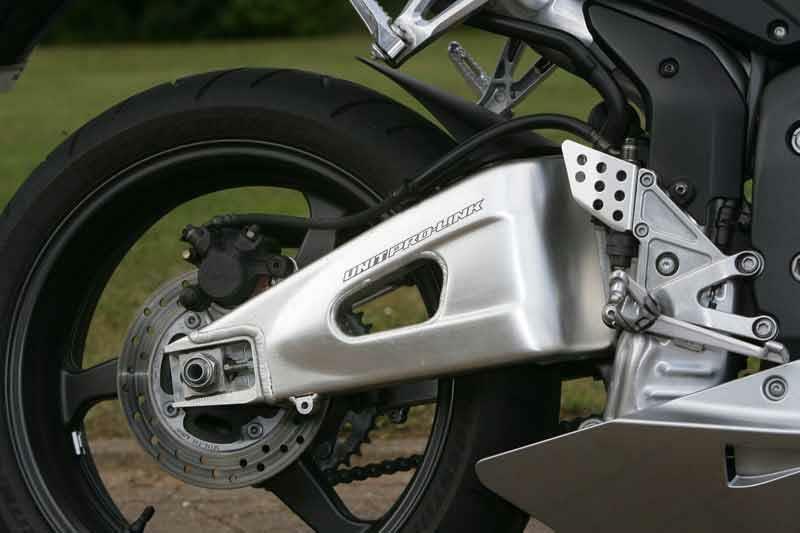 Clever rear system mounts the Honda CBR600RR shock in the swingarm like a MotoGP bike. 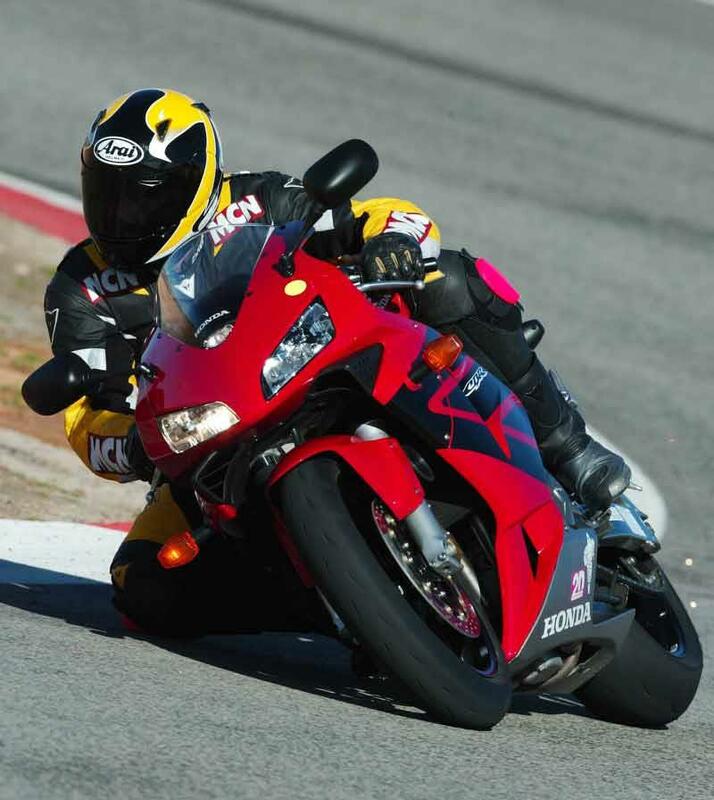 While not the lightest in its class, the Honda CBR600RR’s a superb handling motorcycle. Quick steering yet pretty stable on a smooth track with huge angles of lean achievable. Brakes are hard to fault too. 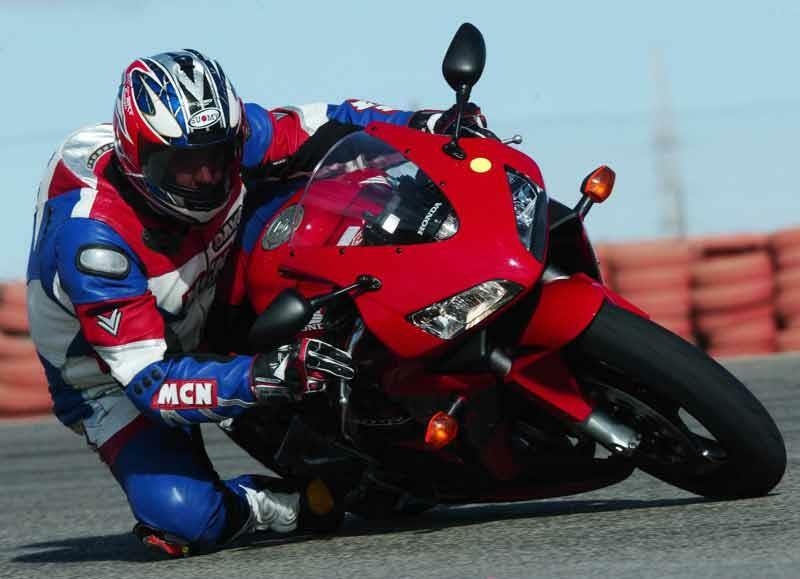 But Honda CBR600RR can be slappy on the road. A 599cc in-line four is the staple lay out for a sports 600, with good reason – it works brilliantly. The Honda CBR600RR needs revving to extract all its 115 claimed bhp and with the red line at 15,000 rpm you’ll feel like a MotoGP rider as you do it. 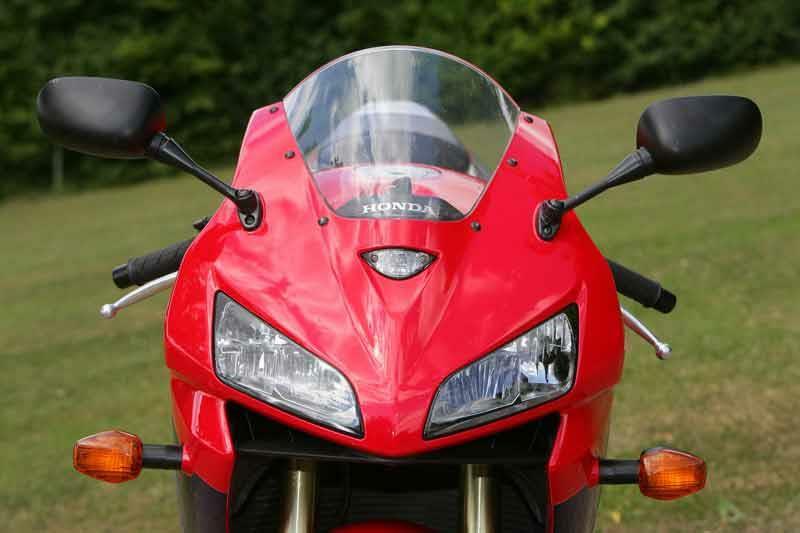 Like so many fuel injected Hondas, the Honda CBR600RR doesn’t manage many MPG. The Honda CBR600RR's no match for the Hondas of 15 years ago (when less environmentally friendly but more durable paints were in use) but still a well finished motorcycle. 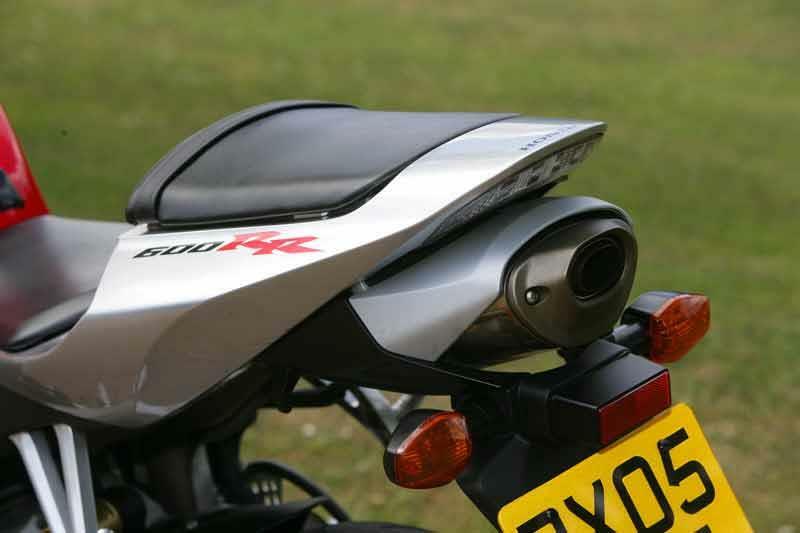 ’05 onwards Honda CBR600RRs have stainless downpipes. 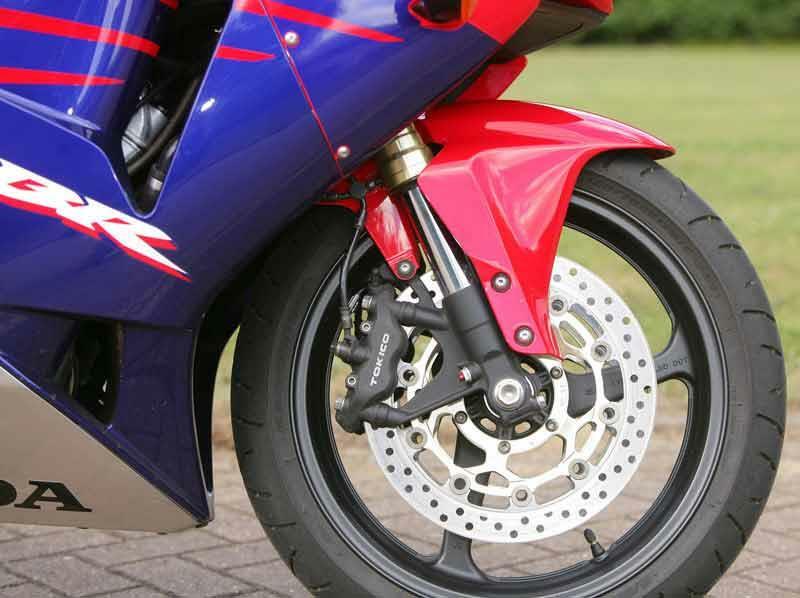 Honda recalled some 2003 and 2004 motorcycles to correct a fault which might have caused the rear brakes to seize. 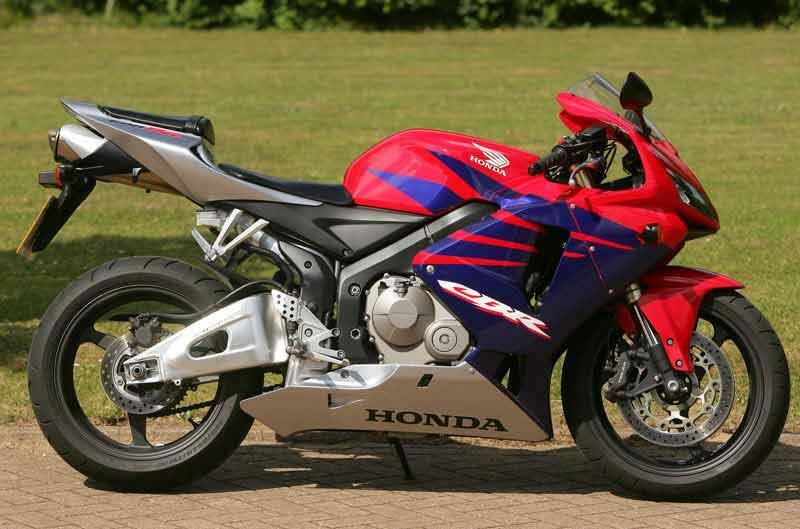 Official UK Honda CBR600RR should have been done but check parallel imports. Competition’s hot in this class. Two year updates and four year major overhauls are common on the sportys 600s. When you buy your Honda CBR600RR dictates exactly what you pay. If you’re buying a Honda CBR600RR new, don’t pay full list price unless it’s spring and you’re getting an all-new Honda CBR600RR. 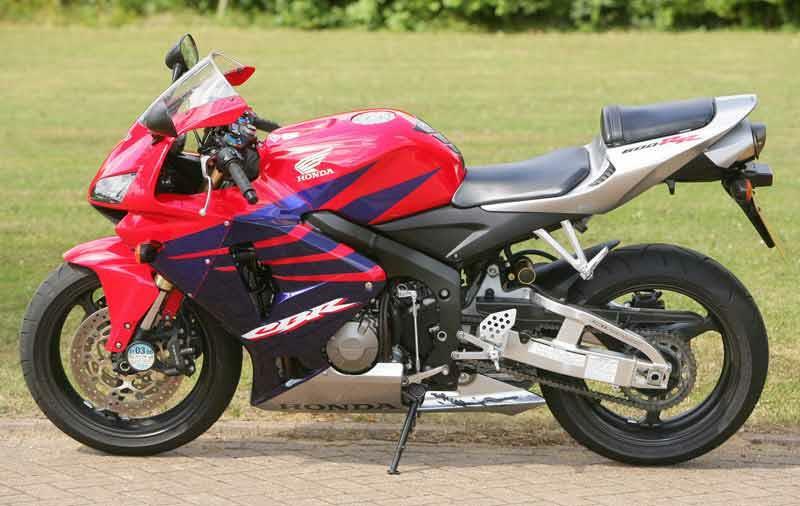 Find a Honda CBR600RR for sale. 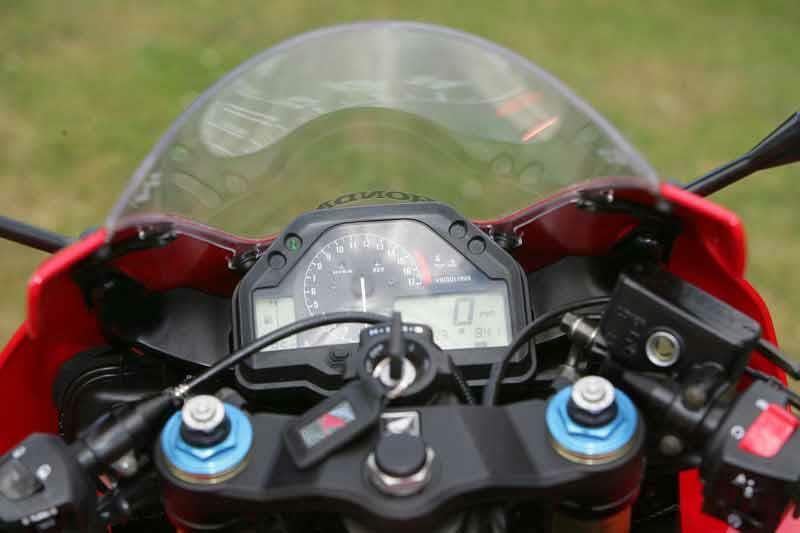 The Honda CBR600RR's clocks are incredibly comprehensive for a track biased machine. Under seat storage space on the Honda CBR600RR is almost nil thanks to the exhaust system. Comfort’s ok in short bursts and better at speed when wind pressure takes the weight off your wrists. Honda CBR600RR Pillions had better be brave. 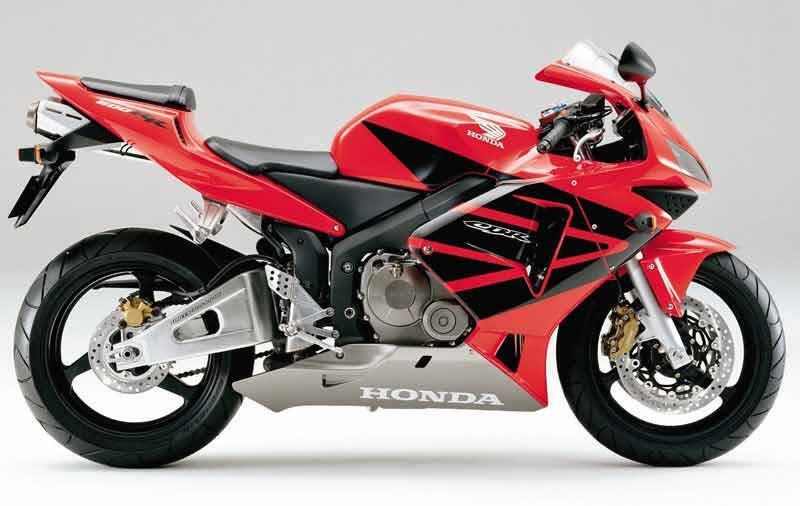 2003: Original Honda CBR600RR model launched. 2005: Updated Honda CBR600RR with USD forks, 6kg less weight, radial brakes, suspension mods and more. 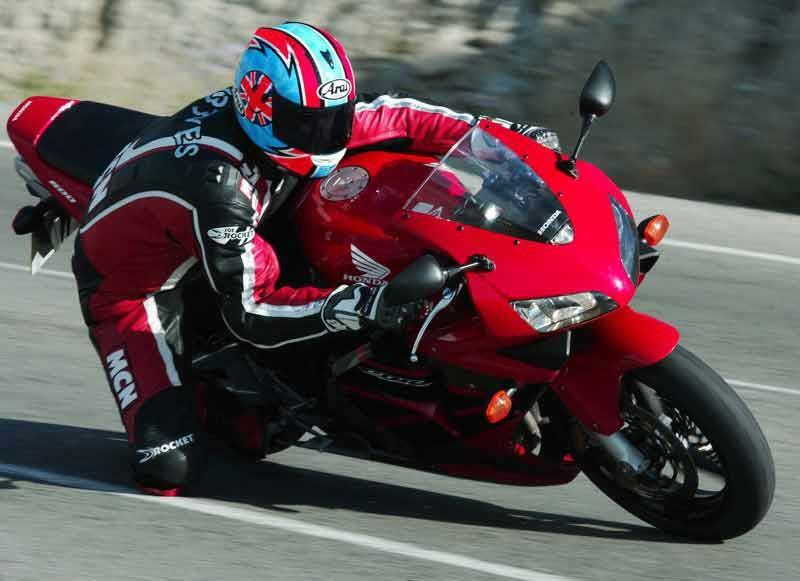 16 owners have reviewed their HONDA CBR600RR (2003-2006) and rated it in a number of areas. Read what they have to say and what they like and dislike about the bike below. HANDLES SUPERB AND EASILY KEEPS UP WITH BIG BOYS, AND CAN ACTUALLY GO FASTER TOP END THAN SOME. ABSOLUTELY AWESOME SCREAM TO 15000 RED LINE LIKE A JET FIGHTER. Bought the bike new.good fun bike would recommend Pirelli Diablo Supercorsa tyres for fast riders standard tyres are borin power ok really need to work it keep the revs high fun bike It really puts a smile on your face. rr5 bought from new, engine pulls in all gears and revs, brakes good and forgiving if you get out of shape. surprisingly good mpg 50+ if you don't go mad. Front page of The Sun speeds are seriously easy to achieve. Would have liked to see a self cancelling indicator like my 20 year old YPVS as well as a gear indicator if only for top. Wrists can ache after only short distances but better technique helps. Great bike overall, can't see anything out there i'd rather be on at the mo. Cracking bike - my first big bike after years on a 125. The bike is nimble and light and easy to ride at low revs. Twist the throttle and she comes alive - needs high revs for top end power. If ridden well the bike can easily compete with 1ltr bikes. Looks good, simple dash, easy to maintain, reliable and very very quick. and a sore arse are the main faults to this bike but apart from that put on some decent tyres such as the Pirelli Diablo Supercorsa, find a nice twisty smooth road and eat those miles up with a big grin on our face! 06 600RR - Loved it! Spent a year with a 06 600RR and loved it! It really puts a smile on your face. It looks great and the unit pro suspension really gives confidence to get on the gas early… really it does! The engine is a peach, smooth as silk but with a naughty side which makes you want to play with the rev counter flicking around 10k! It is also comfy (for a supersport) and is put together better than the 1000RR I now have. Any weaknesses? Er, there is not much wind protection unless you duck down but this was not bad enough for me to do anything about it!. For me the 05/06 600rr looks better than the 07 and there are elements of the 600RR that are better than the 1000RR. Highly recommended! Bought this bike last summer for a scratch under £4k and as my first 'big' bike, its incredibly easy to ride with enough power to do some serious damage. Fantastic handling, acceleration and most of all, looks.. Inspires bags of confidence and as you would expect from a honda, virtually bullet proof. On the down side, anything over an hour on it requires a massage, zero storage, and i mean zero - if you want to take anything bigger than a credit card take your backpack. All in all though, an awesome bike. I had a CBR400rr before this and that was a great bike!! Roadtested the 600RR on it's release and thought WOW!! Unfortunately I couldn't stretch to one, as I was buying another house at the time. Decided I had to get a 600 this year, tried the GSXR, and the 636 Kwaka, but the bike for me on looks and handling was RR all day long!! I love it!! Strengths: The handling is fantastic, you think it, the bike does it. Smooth and responsive on the throttle and great brakes. It's a fantastic all rounder!! Weaknesses: I can't really find any faults, apart from its a nightmare to clean, without removing the fairings. But hey, I don't take it out in the wet!! A great all round bike. After getting used to riding here on a 400, this is the best thing I have done. Had the option of going for a Fireblade. No regrets. Strengths: A very user friendly bike that has no trouble keeping up with the big guys. All round just perfect. Weaknesses: No gripes. But the one thing I have a problem is storage space. But then on sport bike, is storage a problem? I bought this for £5000, after dropping back to an Aprillia RS125 2 stroke for the last year. Obviously it is vastly quicker, but for a heavier bike, the handling and turn in is actually better on the CBR. I haven't had any problems with low torque at low revs, but then maybe this is coming back up from a small 2 stroke! Opened up in 6th at 60mph, and in the blink of an eye she was doing 120 - what lack of torque ? Typical quality honda build, surprisingly easy to ride in traffic and round town, but livens up considerably when on the open road. Even pretty good with pillion, although my wife is less than 8 stone, probably harder with a heavier passenger. Bought this in (narrow) preference to a Ducati 748R, no regrets though. Strengths: Handling, brakeing and 'rider friendlyness', Covetous looks from other riders (plus my 17 year old brother and his mates!) Weaknesses: A driving ban is just a twist of the throttle away ! I bought this bike a couple of months ago and its been great fun. I had an old CBR600f which was great and could do anything, but this bike is a big step on. The acceleration, braking and handling are superb. It is a little bit stodgy in the lower revs, but this bike is designed to be revved and once you do its like being strapped to a rocket. Cleaning is a pleasure - pain thing. Its nice when its done but getting into all the nooks and cranny's is a pain. Strengths: Superb through the bends..good build quality. Weaknesses: The seat. Its like sitting on a park bench..and is only good for about 40 miles. Thinking of changing it for a Corbin..